Production: Maurice McEndree; colour, 16mm; running time: 130 minutes. Producer: Maurice McEndree; screenplay: John Cassavetes; photography: Al Ruban; editor: Al Ruban, Maurice McEndree; assistant director: George O'Halloran; art director: Phedon Papamichael; music: Jack Ackerman; sound: Don Pike. Cast: John Marley ( Richard Forst ); Gena Rowlands ( Jeannie Rapp ); Lynn Carlin ( Maria Forst ); Fred Draper ( Freddie ); Seymour Cassel ( Chet ); Val Avery ( McCarthy ); Dorothy Gulliver ( Florence ); Joanne Moore Jordan ( Louise ); Darlene Conley ( Billy Mae ); Gene Darfler ( Jackson ); Elizabeth Deering ( Stella ). Cassavetes, John, Faces , New York, 1970. Adler, Renata, A Year in the Dark: Journal of a Film Critic 1968–69 , New York, 1969. Kael, Pauline, Going Steady , New York, 1970. Sarris, Andrew, Confessions of a Cultist: On the Cinema 1955–1969 , New York, 1970. Kauffman, Stanley, Figures of Light: Film Criticism and Comment , New York, 1971. Simon, John, Movies into Film: Film Criticism 1967–70 , New York, 1971. Kinder, Marsha, Close-up: A Critical Perspective on Film , New York, 1972. Bowers, Ronald, in Magill's Survey of Cinema: Volume 2 , edited by Frank Magill, Englewood, New Jersey, 1981. Alexander, George, John Cassavetes , Munich, 1983. Carney, Raymond, American Dreaming: The Films of John Cassavetes and the American Experience , Berkeley, 1985. Gavron, Laurence, and Denis Lenoir, John Cassavetes , Paris, 1985. Carney, Raymond, The Films of John Cassavetes: Pragmatism, Modernism and the Movies , Cambridge, 1994. Variety (New York), 26 June 1968. Austen, David, "Masks and Faces," in Films and Filming (London), September 1968. Madsen, Axel, Sight and Sound (London), Autumn 1968. Dawson, J., Monthly Film Bulletin (London), December 1968. Gow, G., Films and Filming (London), December 1968. Clouzot, C., Film Quaterly (Berkeley), Spring 1969. Benoliel, B., "L'idéal du collectivisme," in Revue du Cinéma (Paris), March 1992. Nevers, C., Cahiers du Cinéma (Paris), March 1992. De Bruyn, O., Positif (Paris), June 1992. Carney, Ray, "Seven Program Notes from the American Tour of the Complete Films: Faces, Husbands, Minnie and Moskowitz, A Woman Under the Influence, The Killing of a Chinese Bookie, Opening Night, Love Streams ," in Post Script (Commerce), vol. 11, no. 2, Winter 1992. Levich, Jacob, "John Cassavetes: An American Maverick," in Cineaste (New York), vol. 20, no. 2, 1993. Hejll, A., "Nargangen Kamera," in Filmrutan (Sundsvall), vol. 36, no. 1, 1993.
Review, in Télérama (Paris), no. 2365, 10 May 1995. An admirer of the stark cinema verite style of documentarians Lionel Rogosin and Shirley Clarke, actor-director John Cassavetes strived to achieve the same sense of in-your-face realism in his fiction films. Cassavetes's modus operandi was to bring together a group of his committed actor-artist friends, hand them a script that served mainly as a blueprint, then let them cut loose before his camera, capturing their improvisational investigations of character like a roving newsreel photographer, shooting on nights and weekends over several months, even years, until he had a feature length film in the can. gave the performances of their lives in his films—performances that often went unnoticed by most moviegoers as Cassavetes's low-budget, independent features seldom received widespread circulation. Faces , a tale of suburban angst and adultery, was an exception. It was a major hit. 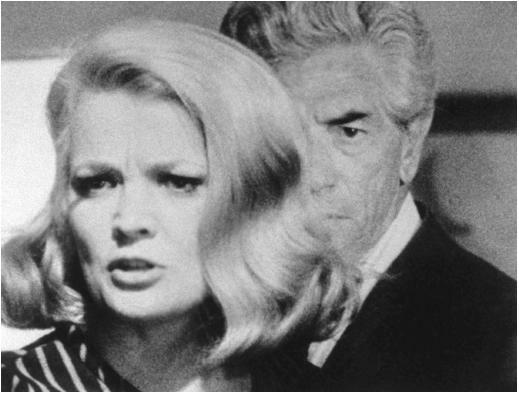 Faces wound up on many important film critics' Ten Best lists and scored three Oscar nominations, two in the Best Supporting Actor and Actress categories (for Seymour Cassel and Lynn Carlin, respectively) and one for Cassavetes's original screenplay. None of them won, but their accomplishment was no mean feat in the face of the competition Cassavetes's $50,000 black-and-white film had that year from such films as Oliver!, 2001: A Space Osyssey, The Lion in Winter , and Rosemary's Baby (in which Cassavetes had co-starred). Faces was Cassavetes's fourth feature as a director. He had previously helmed two films for the major studios, Too Late Blues (with Stella Stevens and Bobby Darin) and A Child is Waiting (with Judy Garland and Burt Lancaster). Finding the studio system too restrictive for his semi-improvisational style, he opted to work outside that system, bankrolling his own films from his fees as an actor in big-budget Hollywood movies and using his friends as players (they were paid a percentage of the profits, if there were any, rather than a salary), as he had done with his debut feature, Shadows (1960). Cassavetes financed Faces from his earnings in two Hollywood blockbusters, The Dirty Dozen and Rosemary's Baby. He shot the picture over a four-year period with a hand-held 16mm camera, using his own home, the houses of his cast members and other readily accessible (i.e. inexpensive) locales. The first cut was six hours long, but Cassavetes and his editor reduced this to a releasable 129 minutes. He then had the film blown up to 35mm, the standard gauge for theatrical distribution, and launched a tireless campaign single-handedly to get the film noticed and acquired. Traveling the film festival circuit with the cans of film under his arm, and using his status as a popular movie star to trumpet his movie on talk shows from coast to coast, Cassavetes marketed Faces into a small but lucrative hit. In addition to those already mentioned, the standout cast includes John Marley portraying the TV producer husband of Carlin who seeks solace from his stale marriage in the arms of a prostitute (played by Gena Rowlands, Cassavetes's real-life wife and a ubiquitous presence in most of the actor-director's handmade productions). Seymour Cassel's sympathetic hippie, who picks up Carlin when she visits a discotheque with some girlfriends, then saves her from a suicide attempt brought on by her guilt over their affair, serves as the film's conscience. There aren't a lot of laughs in Faces , but there is a lot of laughter— most of it on the verge of hysteria—as Cassavetes's eavesdropping camera relentlessly exposes, with power and precision, the layers and layers of supturating emotional wounds and longstanding despair ripping apart the lives of his desperate middle-aged suburbanites.